BoxTV is online platform where you can browse tons of movies and live Indian channels with world class user experience. You get access to lots of bollywood, hollywood movies and typical tv shows as seen on star plus, sony, colors etc. Actually it’s a premium service but as a part of deal you will get BoxTV 1 month subscription worth 199 Rs absolutely free. You can also download it’s android version from Google play store. 1) Click here to open offer page and select 199 Rs monthly plan. 2) Fill up your details and at the bottom, look for coupon code option. 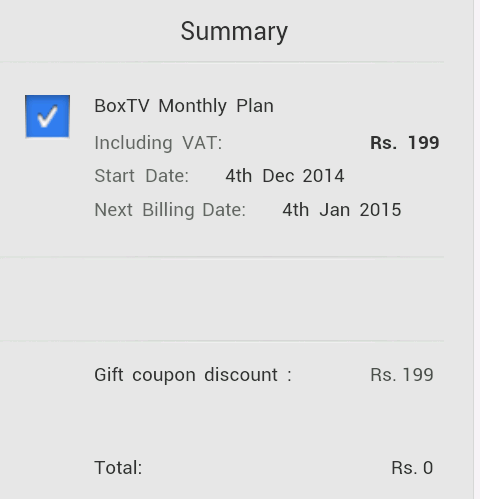 3) Apply promo code DMBOXTV and your account will get discounted to zero rupees as seen in screenshot. 4) Enjoy 1 month premium services from box TV absolutely free.